Davco sells gifts such as china, silver plated giftware, fashion forward frames, bakeware, canister sets, novelty candles and other products. 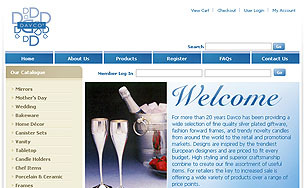 Bitochon’s Ecommerce website development for Davco allows the company to make changes to the site without the assistance of a programmer as merchandise changes. Customers can shop online and purchase items simply by completing the order form and using a credit card. The site includes a company profile, an FAQ, a page where customers can register, and a contact page.